Healing. What is it? Where is it from? Unlike some of my other work, this painting was not inspired by a dream. One reason I enjoy creating art is that I can drift into a focused realm that is “in the moment of doing.” During this process, I somehow turn down the volume of outside distractions and on-going mind chatter and enter a sort of creative, healing meditation. 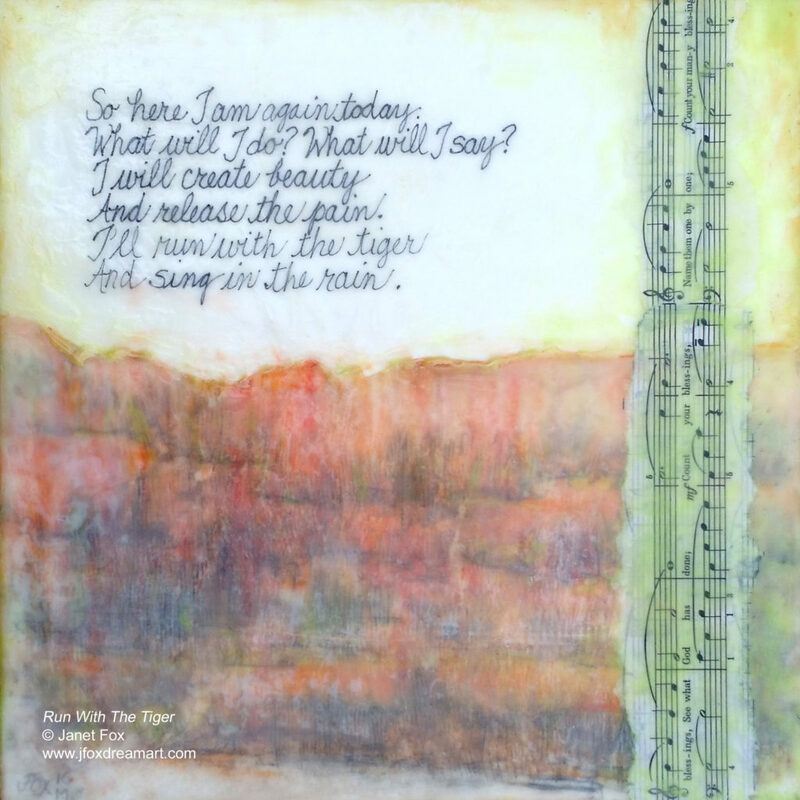 I painted this encaustic image on top of an earlier painting on canvas that I had also previously collaged over with bits of incomplete paintings and writing snippets. While building up the layers, including the top ones of melted pigmented wax, I decided to let the title words poke through. Do you see them? Other words on the under paintings, which I blurred or covered over, can be forgotten. I felt enlightened by the words that poked through clearly; they looked right and made me feel good. In a literal sense, “healing” means to “make whole.” My energy and intentions while painting come from somewhere inside. Perhaps painting this art allowed me to become more whole. The words poked through from a deeper source of knowledge, like writing myself a reminder note so I wouldn’t forget. The multiple layers also remind me of the complexity of life and how the experiences of today layer on top of those from many yesterdays. In some way, my life IS my artwork, since I add new layers of experiences every day while deciding what to focus on or forget. After I finished this painting, I photographed and exhibited it at the Montgomery Art Association Gallery. Several months later, I decided to scrape off all of the wax and other layers, down to the base canvas surface. As a result, the painting no longer exists in its original physical form. Now, it exists only as a combination of zeros and ones in the digital realm. I make prints of it for art greeting cards. 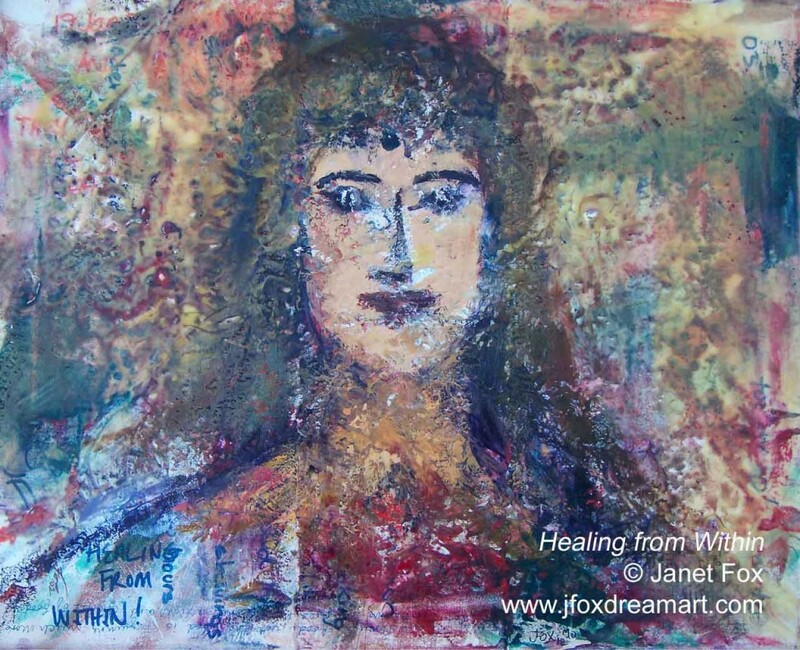 Through this painting, I explored how healing energy is present deep within. I can help it break through the layers of time to the awareness of daily life. Now that I know this, I can not un-know it. Contemplation: Have you found healing energy from somewhere deep within? Did you do something intentional to release it? ⇒ For information about purchasing art cards, contact Janet Fox.